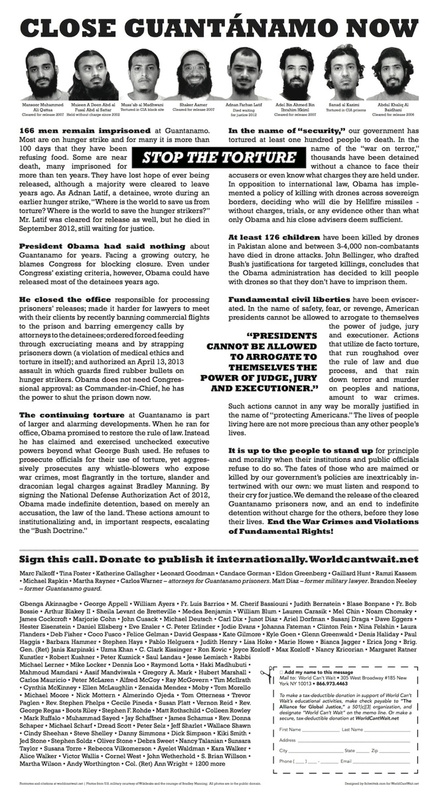 As one of the 1,200-plus signatories to the full-page ad that appeared in The New York Times, calling for the closure of Guantanamo, I was disappointed in President Barack Obama’s speech Thursday on counterterrorism, drones and Guantanamo. In a carefully crafted – at times defensive, discourse, Obama said, “In some cases, I believe we compromised our basic values – by using torture to interrogate our enemies and detaining individuals in a way that ran counter to the rule of law,” adding, “We unequivocally banned torture.” But Obama failed to note that the United Nations Human Rights Commission determined in 2006 that the violent force-feeding of detainees at Guantanamo amounted to torture and that he has continued that policy. Obama did not say he would close Guantanamo. He criticized Congress for placing restrictions on transferring detainees who have been cleared for release, although he signed the legislation Congress passed. To his credit, Obama lifted the moratorium on detainee transfers to Yemen and appointed a new senior envoy at the State Department and Department of Defense to oversee detainee transfers to third countries. But Obama did not pledge to use the waiver provision contained in Section 1028(d) of the 2013 National Defense Authorization Act that would allow the Secretary of Defense to authorize transfers when it is in the national security interest of the United States. Nor did he promise to stop blocking the release of detainees cleared by habeas corpus proceedings. Obama understands that not all wars are just wars. He was referring to, but misapplied, three principles of international law that govern the use of military force. Proportionality means that an attack cannot be excessive in relation to the anticipated military advantage. Yet when drones are used to take out convoys, large numbers of civilians will be, and have been, killed. Last resort means that a country may resort to war only if it has exhausted all peaceful alternatives to resolving the conflict. By assassinating rather than capturing suspected terrorists and bringing them to trial, Obama has not used military force as a last resort. And self-defense is defined by the leading Caroline Case of 1837, which said that the “necessity for self-defense must be instant, overwhelming, leaving no choice of means and no moment for deliberation.” The Obama administration has provided no evidence that the people it targeted were about to launch an imminent attack on the United States. New Rules for Drone Strikes? Although he defended the use of drones and targeted killing, Obama proclaimed, “America does not take strikes when we have the ability to capture individual terrorists – our preference is always to detain, interrogate and prosecute them.” Yet, 4,700 people have been killed by drone strikes, only two percent of whom were high-level terrorist suspects. And Obama has added only one person to the detention rolls at Guantanamo since he took office. “This [Obama] government has decided that instead of detaining members of al-Qaida [at Guatanamo] they are going to kill him,” according to John Bellinger, who formulated the Bush administration drone policy. Obama referred to the killing of Osama bin Laden as exceptional because “capture, although our preference, was remote.” Yet it was clear when the US soldiers arrived at bin Laden’s compound that the people there were unarmed and bin Laden could have been captured. Obama admitted, “The cost to our relationship with Pakistan – and the backlash among the Pakistani public over encroachment on their territory – was so severe that we are now just beginning to rebuild this important partnership.” Indeed, in light of Pakistan’s considerable arsenal of nuclear weapons, Obama took a substantial risk to our national security in breaching Pakistan’s sovereignty by his assassination operation. Ben Emmerson, UN special rapporteur on counterterrorism and human rights, said the drone strikes in Pakistan violate international law. “As a matter of international law, the US drone campaign in Pakistan . . . is being conducted without the consent of the elected representatives of the people or the legitimate government of the state,” he noted. Obama said we are “narrowly targeting our action against those who want to kill us.” He did not address his administration’s policy of using drone strikes to kill rescuers and attendees at funerals after the original strike killings. The requirement of a “legal basis” for the use of lethal force. It does not define whether “legal basis” means complying with ratified treaties, including the UN Charter, which prohibits the use of military force except in self-defense or when approved by the Security Council. There must be “near certainty” that the terrorist target is present. Neither the Fact Sheet nor Obama in his speech addressed whether the administration will continue “signature strikes” (known as crowd killings), which don’t target individuals but rather areas of suspicious activity. There must be an assessment that “capture is not feasible” at the time of the operation. It is unclear what feasibility means. The White Paper appears to indicate that “infeasible” means inconvenient. There must be an assessment that relevant governmental authorities in the country where the attack is contemplated cannot or will not effectively address the “threat to US persons,” which is left undefined. There must be an assessment that no other reasonable alternatives exist to address the “threat to US persons,” also left undefined. A few days before Obama’s speech, Attorney General Eric Holder publicly acknowledged the killing of four US citizens, only one of which – Anwar Awlaki – was actually targeted, in 2011. That means 75 percent were “collateral damage,” including Awlaki’s 16-year-old son, Abdulrahman. In his speech, after affirming that a US citizen cannot be targeted and killed without due process (arrest and trial), Obama claimed that Awlaki was involved in terrorist plots in 2009 and 2010; this is long before Obama ordered that he be killed by drone strike in 2011, which would appear to violate the “imminence” requirement. Indeed, Lt. Col. Tony Schaefer, a former Army Intelligence officer, said on MSNBC that Awlaki could have been captured but the administration made a decision to kill instead of capture him. During Obama’s speech, Code Pink’s Medea Benjamin yelled out several questions before being escorted out of the room. * What about the indefinite detention? * What about the 102 hunger strikers? * What about the killing of 16-year-old Abdulrahman al-Awlaki? Why was he killed? * Can you tell the Muslim people their lives are as precious as our lives? * Can you stop the signature strikes that are killing people on the basis of suspicious activities? * Will you apologize to the thousands of Muslims that you have killed? * Will you compensate the innocent family victims? That will make us safer here at home. * Can you take the drones out of the hands of the CIA? * You are commander-in-chief. You can close Guantanamo today! You can release those 86 prisoners [cleared for release]. It’s been 11 years. * I love my country. I love the rule of law. * Abide by the rule of law. You’re a constitutional lawyer. Obama responded, “I’m willing to cut the young lady who interrupted me some slack because it’s worth being passionate about. . . . The voice of that woman is worth paying attention to.” But he went on to say he obviously doesn’t agree with much of what she said. One wonders what parts he does agree with. Marjorie Cohn is a professor at Thomas Jefferson School of Law and the editor of The United States and Torture: Interrogation, Incarceration, and Abuse. She is working on a book about drones and targeted killing. The US has picked an endless fight it cannot possibly win and it has acted against it’s basic principles in doing so. The suspension of Habeas Corpus, torturing of prisoners, lying itself into wars have done nothing but to harm the country. It is high time NOW for the US to stop this careening down the road to the inevitable disasters waiting around each and every corner!! The war on terror is a self fulfilling series of battles that will NEVER BE WON. the President’s recent speech “Obama’s Reinhold Niebuhr act,” referring to a famous Protestant theologian who sought ethical answers to modern life’s persistent questions. Hard to argue with any of such a critique. Bush declared the “War on Terrorism” almost 12 years ago. At that time many reacted that such a war was an unwinable exercise in brutal frustration. Having avoided the need to declare war with the likes of the SLA, the Weather Underground, the Red Army the Unabomber and a host of others, the ideology that conceived the “war on Terrorism” continues to be with us today – advocated by many of the same people who invented this bankrupt concept in the first place. But to Ross Douthat’s complaint, “… this president is constantly examining his conscience in public…” I see him as trying to get the public to have a conscience for “We the People” have gone down a dark path that opened Gitmo in the first place. Douthat seems to enjoy taking no responsibility – but to me, to a columnist for the most powerful media in the nation, The New York Times, the media is the cheerleader for our political troubles because they love, they need conflict. The GOP could not have sold ‘fear’ without the help from media. Have not Gitmo become the symbol of all of our fears? Fear of outside threats; fear of inside failures. It would be refreshing to see the media examine their role in the making of Gitmo. Older Article: Are San Diego Taxi Drivers Driven to Despair?